Baosteel Italia Distribution Center imports high quality steels from China and markets them in the automotive, household appliances, electric motors, transformers and food packaging sectors. The company was established in 2001 as a joint venture between Baosteel Group, the world’s second-ranking steelmaker by production volume and turnover, and the Malacalza family of entrepreneurs, who have over forty years’ enterprise experience in the steel sector. 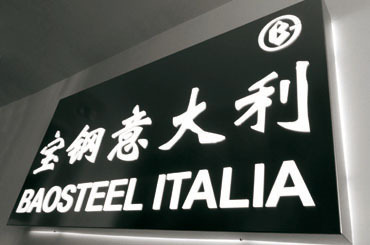 In its first ten years of life, Baosteel Italia has imported over 2.5 million tonnes of steel, reporting total turnover in excess of 1.4 billion euros. The Genoa-based company, which opened a Service Center in 2011, continues to pursue its development path focused on product quality and excellent service, each and every day.